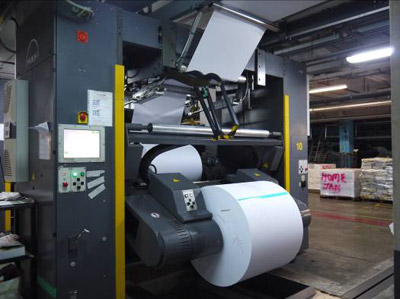 “HKC Green RFID Paper Roll Tracking & Inventory System” is a first-ever developed RFID system to facilitate the real-time tracking and tracing of newsprint rolls moving within printing press hall of a client, Singapore Press Holdings. Each paper roll is equipped with a tailor-made prototype roll tag holder in both active and passive RFID technology with motion sensor. An individual roll can be identified by scanning the passive tag by a handheld terminal; the active tag can be communicated to reader proactively and reactivated by a motion sensor. At the production area, HKC has implemented the innovative use of algorithm calculation for the meter counting which is vital for the calculation of remaining paper on each roll for each printing job and the application of the first-come-first-served principle for paper roll usage. Further, an innovative tag2tag RFID application is applied under zone based solution infrastructure. The adoption of dual channel mobile tag delivers the transmission and receipt function for communicating both with reader and location tag that achieved accurate location checking and energy saving. The execution of this system not only ensures the minimization of paper wastage; it also leads to a less paper demand thus a reduction on the cut down of trees.